Do your children hate basic math? Or any kid you know who is currently struggling with basic math? Stop worrying, we have got something which is not only easy to use, but fun as well. So without any more delays the product which I am going to review is one of the best educational toy for children you will ever find. When we have a first look at the product it looks good and funky, but when it is used for educational purpose it proves it value and you clearly can understand how is it be used. 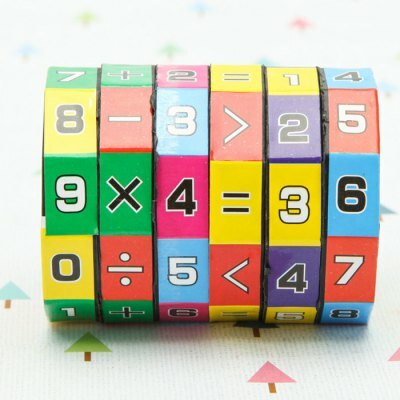 The cube is an easy with hands and not bulky, it’s made with plastic and smooth & easy to use, the product would make you kid happy and learning basic math will not be a problem for them. Talking about the designing part, the outlook is pretty well and interesting, it is with 6 layers with numbers and mathematical signs. There are 6 decagons present which represent different numbers from 0 to 9 and basic mathematical signs (plus, minus, multiply, divide and equals to). The best part of the cube is that it combines education with fun and makes teaching more interesting and understanding more easy. With different colors and cartoon images present on sides of cube makes it more attractive and colorful and fascinate children by which they respond, interact more hence they easily clear their doubts and learn more with cube. The product is priced at a very reasonable and affordable rate of around $2 which is not a big amount. Though there are more puzzle educational present but this is among one of the best among these affordable rates. Wrapping up the product we could say we can that the product is good looking, attractive, user friendly, and is no less when compared with a toy.